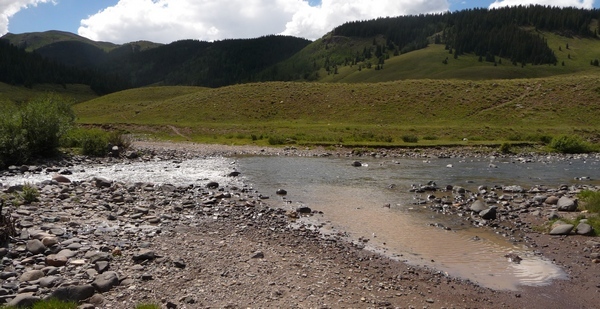 I’d heard there was a pass from Silverton that would take me to the Rio Grande headwaters. 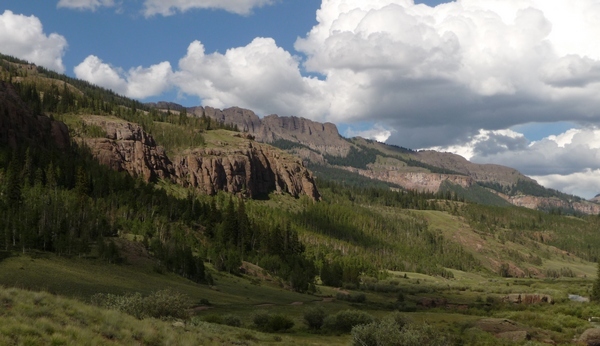 Indeed there is—Stony Pass—and I traveled over it on August 6th to see the Rio Grande and more. The detailed GPS track is at the bottom of the post. I’ve got to tell you though, that although the road does connect all the way over to Lake City, there’s a stretch in the middle that quite simply isn’t meant for human consumption. Let’s start with the good part. Howardsville, supposedly a ghost town near Silverton, is only a few miles up the road that eventually goes to Animas Forks. It’s easy to find the turnoff, because there are signs directing one to the Old Hundred mine tour. You can either go straight or take the road up past the mine tour, as the two roads meet on the far side. After awhile you’ll need to take a left—the signage is good—and head up toward the pass. As you go up, you can look back and this is what you’ll see. If you pause on your ascent to Stony Pass and look back, here's what you'll see. The road to the pass itself is well maintained if rather steep. I had no trouble with it at any point and the scree is minimal. Here's the view as you approach the pass itself. It's well above tree line. You’ll know you’re at the top when you see the sign. Here's the sign at the summit. 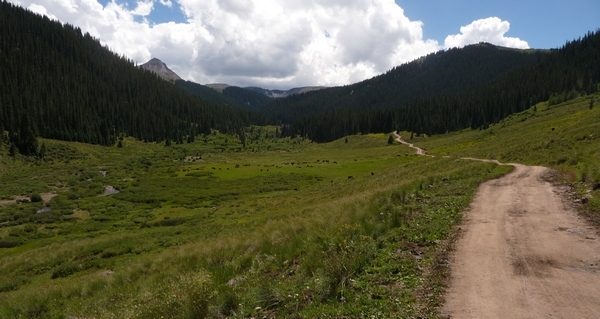 The pass is 12,650 feet above sea level. Here's what you see from the top looking east. So far it seems tame enough. The geography is rather different on the far (east) side of Stony Pass. It doesn’t seem to feature the enormous igneous upthrusts that are to the west, but more strata and cliffs, although you are most certainly in the San Juans. The geology seems subtly different to the east. Here's a glimpse of what's in store. Now I’ve got to warn you. Things are okay for awhile because you’re still in San Juan County with its well-maintained roads. In fact, Stony Pass is San Miguel County Road 3. It’s a relatively gentle descent and after awhile you’ll come to an intersection with San Miguel County Road 3A. Actually, the intersection is in Hinsdale County. The sign is rather more decrepit than San Juan County’s. That should have been the first indication of trouble. Here’s the sign at the intersection, which one must look back to the west to see. Here's the sign pointing to Kite Lake. Note that this sign faces east, so be on the lookout. Also note the peeling letters. Interestingly, and I’ll point this out in passing because I didn’t check it out, there’s a single track heading north from just a few feet further down the road. The trail is Pole Creek Trail, and I have no idea where it goes. Someday when I’m with someone, I’ll give it a try. Here's the sign to Pole Creek Trail, a single track open to motorcycles. When turning onto the road to Kite Lake (which quickly becomes San Juan County Road 3A), the first thing you have to do is ford the Rio Grande. Yep, that’s the Rio Grande in the picture. Look carefully at the proportions—the ford is broad and about a foot to a foot and a half deep. You’ll be riding across rocks, so use your very best technique to keep your bike upright. As far as getting wet, well, you can’t ford something like this without taking on at least some water in your boots. This is a lot wider than it might look in this small picture. But you need to ford here. The river bed has been dammed a little to create a ford. The road underneath the water consists of rocks about the size of your fist, all loose. From there you’ll see the road, which starts out innocently enough. After fording the Rio Grande, here's what you'll see. It starts out as a reasonable dirt road, albeit rutted. It doesn't stay reasonable for long. Okay fair warning: the road gets rougher as you go up. Eventually it goes past a few places to camp, then turns steep with some scree. To top it off, as you get near the top, the creek bed and the road are one and the same! So you’re climbing up wet rock while the creek goes the other way! But persevere, because the lake is simply stunning. This is the view from the base of the rockfall looking back down the canyon. The lake is so wide I had to stitch together photos in Adobe Photoshop Elements 6 to create this panoramic view. Simply stunning! I found several people at the top, all taking pictures and admiring the view. It’s worth persevering all the way. Now…before I present the GPS track, I’ve got to warn you. If you go back to the main road and continue east, you are in for trouble. The road deteriorates rapidly. I found numerous scree-filled steep declines that I decided I didn’t want to go back up. Eventually (and this is where “there be dragons” comes in), you get to the point where you have to ford a beaver pond. Yep, that’s right, a beaver pond. I arrived on its western shore as several people on ATVs were figuring out what to do. Well, I gave it a try first and ended up in water up to mid-thigh! The engine was completely under water and the thermal shock caused it to shut down. I found I couldn’t dismount, so one of the teens in the ATV group—a sainted soul—waded out and held the bike steady while I got off. The two of us pushed the bike to the far shore. Since I was already soaked, I explored the pond a bit and found a place to ford where the water was only to my knees. This proved to be sufficiently shallow to let the ATVs pass. My worst fears were not realized, because I was able to restart the bike without too much trouble. (Thank goodness! I was afraid of Slanty Bridge all over again!). To be fair, from this point the road got steadily better. Apparently the beaver pond is a well-known place that sort of divides the road in two. To the east, I found numerous occupied camping spots. The road got better and better until it was a wide, well-graveled road that any vehicle can use. After a long time I reached the paved highway, went north to Lake City, and then crossed back over to Ouray via Cinnamon Pass. What a day! My advice? 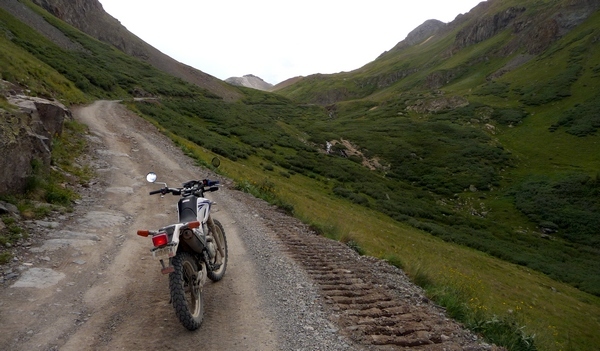 From Silverton, go over Stony Pass, make the side trip to Kite Lake, and then turn around and go back! Maybe someday I’ll go back to that intersection and try the Pole Creek Trail, but as far as going further east, forget it! Here's the GPS track showing the route in detail. Note the warning: there be dragons to the east! This entry was posted in GPS Tracks, Hinsdale County, Motorcycling, San Juan County. Bookmark the permalink. Hello, in reference to your trip over stony pass, I live and grew up in this area and the stony pass road is a paved highway compared to the pole creek trail. Hi Lauren. You’ll probably make it okay if you’ve got a beefy 4WD truck, at least as far as the camping area that’s about two miles shy of the lake. 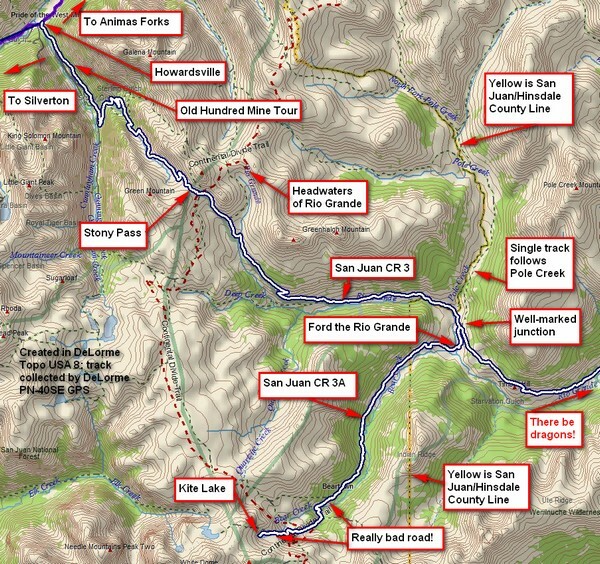 Stony Pass should be no problem, but the road from where it fords the Rio Grande all the way to the lake was deeply rutted the last time I went over it. By deeply I mean 12 to 18-inch deep ruts. I didn’t visit in 2011, so my info may be out of date. Enjoy your visit! Thanks for the great pictures and information. We are thinking about making the trip up to Kite lake in a 4wd truck. How long did it take to get up to the lake?